We are almost into the second fortnight of the year 2017. It is that time of the year where all across, one reads about different lists, and then, makes resolutions very diligently. Only to forget them -as the weeks turn into months!? Thanks to the resolution of last year, I have been listening to podcasts, to trigger & maintain my morning walks, and help me get clued into the best thought leaders. Audible has been a godsend, as WhatsApp and Facebook had in the recent past cannibalised my reading habit. 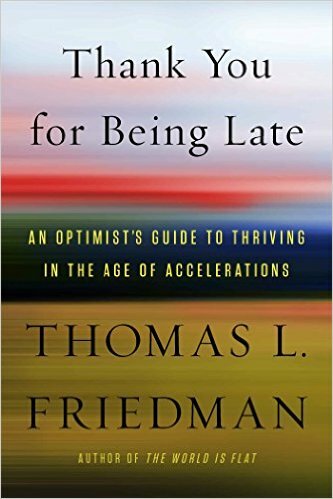 I have just finished 2 hours of listening to Thomas Friedman's latest book -Thank you for Being Late, but it has forced me to pause and reflect. The book essentially reminds us that we are are living through one of the greatest inflexion points in history (perhaps after the printing press days!). And how the planet’s three largest forces - the advance of technology, globalisation and climate change are each driving the other – and how these accelerations are fundamentally reshaping the world. 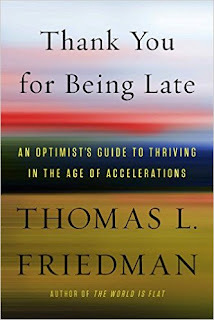 My take away- is that trying to keep pace with the rate of acceleration, is simply futile & overwhelming. I ought to be getting comfortable with being uncomfortable. And focus instead, on my strengths, and my ability to forge deep relationships—to love, to care, to hope, to trust, and to build voluntary communities based on shared values! As a strong believer of collaboration, I think this is my cue to chipping away a lot of things that I no longer add value to ( or which is being done by several others more efficiently and cheaper). 2017 will be a year where I will invest in working more closely with some of the 500+ partners of NPA, the global recruiting network, and orchestrate a network of recruiters across 40 countries. I intend to coax my partners to share insights about the changing expectations of Employers and Employees in their country/domain of expertise, and help more professionals find global opportunities. Here's wishing each one of you a more fulfilling year!